The Spaniard is eagerly looking forward to defending his title at the Dubai Duty Free Tennis Championships next month after enjoying a hugely successful start to the new season. 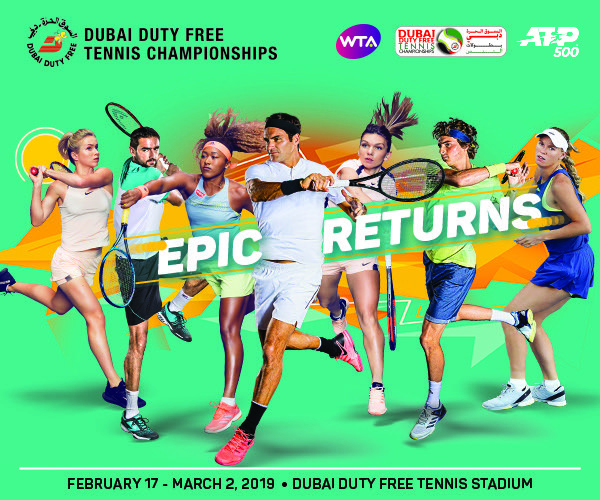 January 31 2019 – DUBAI, UAE: Roberto Bautista Agut is eagerly looking forward to defending his title at the Dubai Duty Free Tennis Championships next month after enjoying a hugely successful start to the new season. The 2018 champion might well have been an unfamiliar name to many when he proudly hoisted the magnificent and unique silver dhow trophy last year. But that was because, while many title winners attract the spotlight, the mild-mannered Spaniard prefers to keep a low profile. While many players need to shake off the rust at the start of a new season, Bautista Agut hits the ground running year after year. While some top names suffer early defeats in the first few weeks of the season, he collects titles – often by taking advantage of those top players who lack his sharpness when the new season gets underway. Bautista Agut is proud to have followed in the footsteps of so many of his countrymen, especially as he once idolised 2001 champion Ferrero and 1998 finalist Mantilla. Bautista Agut will face a formidable challenge as he defends his crown, with seven-time champion Roger Federer, Australian Open sensation Stefanos Tsitsipas, Dubai two-time finalist Berdych, former US Open champion Marin Cilic and Asian number one Kei Nishikori just some who will have an equal appetite for success. Before the men’s event gets underway, tennis fans can enjoy the very best that the WTA Tour can offer, including newly crowned Australian Open champion and world No. 1 Naomi Osaka, two-time Wimbledon champion and 2019 Australian Open runner-up Petra Kvitova, Dubai defending champion Elina Svitolina, reigning French Open champion Simona Halep, three-time Grand Slam winner Angelique Kerber, 2018 Australian Open winner Caroline Wozniacki and former French Open champion Garbiñe Muguruza.